Nahdlatul Ulama (NU, Ulmas' Rebirth), a conservative Sunni group founded in 1926, is the biggest Muslim organisation in Indonesia and one of the biggest organisations of this kind in the world. In 1984, it was chaired by Abdurrahman Wahid, aka Gus Dur, the grandson of the NU founder, Hasyim Asy'ari; Gus Dur was elected President of the Republic in 1999. 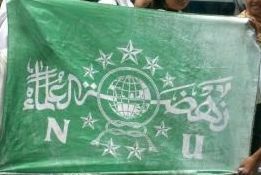 During the celebrations of the 82nd anniversary of the NU in a stadium at Jakarta, members of the group paraded with the flag of NU, which is green with a white emblem formed of a representation of the Earth surrounded by a ribbon and nine stars, a writing in Arabic (?) script and the letters "NU". The flag of NU was also hoisted allover the stadium, in turn with the Indonesian national flag.